We all have wishes and desires for our lives. In most cases, these wishes, and desires are unending. For example, we may wish to lead a healthy lifestyle, wish to earn more money, wish to have a better marriage or wish to have a more intimate relationship with God. But all these wishes and desires will only remain a daydream and a mirage until we decide to be intentional in our pursuits of these things. Peter is an excellent example of intenationality. When he and his fellow disciples were caught up in a storm, and they saw a man walking on water. They were all afraid, but once they realised that it was Jesus – Peter desired to go to Him; he expressed this by asking Jesus, “If it is You, ask me to come.” Jesus gave Him the go ahead, and he immediately acted on His word and walked on water with Jesus. He also demonstrated intenationality at his first encounter with Jesus. He had laboured all night in the quest to feed his family – but it was to no avail. However, when Jesus instructed him to cast his net once more, he demonstrated intentionality by obeying Jesus’ instruction and caught an unprecedented break, so much so that he had to ask for help. On both occasions, Peter was very clear about what he wanted and was intentional about pursuing it. If Peter did not make the decision to call out to and listen to Jesus, he would have never had the experience of walking on water nor experience the unprecedented provision of God. In the same vein, we too may never achieve the things that God has laid on our hearts if we are not intentional like Peter was. One of the things I have learnt in my Christian journey is that I can only be as close to God as I choose to be – regardless of how much I desire it. My mentee will always say that change does not come by chance but by choice. Therefore, it is time for us to stop waiting for our dreams and wishes to come true. We need to rise and take the step of faith required to achieve those things that God has placed in our hearts to do. If we do not take the initial action or decision, our desires and wishes will one day become our regret. Life can sometimes present us with trying times. It may be a rejection, the lost of a loved one, financial difficulties or some other adverse situation that we cannot imagine. These situations can sometimes hit us so hard that all we want to do is give up. Give up hope. Give up on oneself. Give up on life. I found myself in such a state. It was October 19, 2003 when I watched my mum fall to her death, moments after entering the house of her friend. She had lost a lot of energy climbing a flight of stairs to the last floor of the building. This in it self was a distressing time for me, my siblings and our father. But we soon realised that it was only the beginning of a very dark time. A few months after my mother’s passing, we were kicked out of our maternal grandfather’s estate and after squatting with our father’s distant relative – our dad was forced to bring us to the UK, where we were to begin a new life. The only problem was, we did not have the right papers to live legal in the UK. A glimmer of light however came when a Church member helped me and my sister get into school and I was able to study up to college level. This was the first person I was comfortable to call “mum”. After finishing my BTEC Diploma at college, I was unable to progress my education because I did not have the right documents – neither was I able to work for the same reason. So, I was stuck between a rock and a hard place. I watched my peers – who I helped in college get the required grades they need to gain admission into the university of their choice – move on with their lives. I did not see anyway forward for myself and did not really have a hope for the future. The only thing that kept me going was my faith in God, fellowshipping with fellow Christians and working in the Youth Ministry of my Church. But thank God my story did not end there. Whilst volunteering at my Church, I met the love of my life – who is now my wife, and our union has brought untold ray of sunshine into my life. Now, I can see more clearly and the future that God has promised is unfolding. Though the story is not over, whilst discouragement still knocks, I can confidently say, after more than 15 years of loosing my mum – up to this point – that I am in a better place. My story and that of my siblings show that life will always give us a reason to be discouraged. But what I learnt whilst going through this ordeal is that feeling discouraged is not something to be sorry for, nor feel bad about. It is our natural response to a disappointment. What is wrong, however, is if we allow the feeling to control our lives. I pray for you today, that God will heal your heart from the injuries that you have experienced as a result of disappointing situations and that you will received courage in these dark times. But don’t forget to take time to acknowledge what has happened, talk to God and god-fearing people about the situation, think about your options – as well as the resources and people you will need to help you and trust that God loves you and knows what is best for you. I hope this article blesses and encourages you. God bless you! I have been in a recurring battle with discouragement lately, and as a result, I have been feeling inadequate, incompetent and inefficient. Life can be very hard sometimes, without any hope of improvement. But today, as I was discussing God’s Word with my wife and our friend, I felt the Holy Spirit saying to me that the answer to discouragement is for me to take charge of my day. David said in his prayer, “My voice You shall hear in the morning, O LORD; in the morning I will direct it to You” (Psalm 5:3 NKJV). David was being intentional about seeking the face of God. His prayers were not random nor religious – they were specific, and they were intentional. In the same vein, we too need to be intentional about seeking God. One of the ways we can do this is by setting a time in the day – especially in the morning – for prayer and fellowship with God. “Give ear to my words, O LORD, consider my meditation. Give heed to the voice of my cry, my King and my God” (Psalm 5: 1 – 2 NKJV). David never hid his emotions from God. He was never afraid to tell God about how he felt. This attitude and vulnerability is especially important, because as Christians we have learnt to camouflage our feelings through Christianese lingo in the exertion not to be negative. But David was very honest and open about his emotions in the place of prayer to God, because he realised that it is only a heart who is truly open that can receive from God. David’s prayers were not monologues, they were conversations with a living God, whom he saw as his King and his God, “Listen to my voice in the morning, LORD. Each morning I bring my requests to you and wait expectantly” (Psalm 5:3 NLT). David realised that God was not a passive and silent God, but a God Who is active and wishes to communicate with us – His children. David knew that not only was God listening to Him, but God wanted to speak with Him, also. He was expectant to hear back from God. “Because of your unfailing love, I can enter your house; I will worship at your Temple with deepest awe” (Psalm 5:7 NLT). David’s confidence before God had nothing to do with his actions, but God’s love for Him. David was a man who truly feared God but was also persuaded of His love. Because of this, David’s heart was opened to God, knowing that there was nothing on His mind that God does not want to hear about. Learning from the life of David, I have discovered that to overcome discouragement by taking charge of my day, I need to start my day in fellowship with God, by intentionally seeking Him in the morning, being vulnerable to Him, waiting on what He has to say to me and trusting in His love. I am, therefore, inviting you on this journey of devotion to God, not trusting in our actions or abilities, but in our relationship and fellowship with Him. The coming revival is about the Church coming into her place as the custodian of the Earth and for Christians to come into sonship and exercise our authority as sons of God. Notice I did not say children, but sons. The reason for this is because every Christian is a child of God, born of the Word of God (the incorruptible seed) and not of man (the corruptible seed), which is what is meant by being born again. However, becoming a son is as a consequence of maturity and a place of authority. It is not everyone born as a child in the family that is entrusted with responsibility, but only the children who have proved themselves trustworthy that will be rewarded with trust, and as such, are ready to receive and operate in their inheritance. The differentiator between the children who have proved themselves and children who haven’t is just one thing: the Holy Spirit leads the mature children. For us to operate in our inheritance in God, we need to be submitted to the leading of the Holy Spirit. Unless God cannot trust us with what He has kept in store for us. If we study the life of Jesus, you will see that everything Jesus was able to do was by the Holy Spirit. In fact, His ministry could not start, until the Holy Spirit came on Him and the next thing we see is that the Holy Spirit is leading Him to the wilderness. He said that the works He does are by His Father Who lives in Him – the Father He was referring to here was the Holy Spirit. The extent to which we allow ourselves to be led by the Holy Spirit is the extent that God will entrust us with our inheritance and use us as tools in His hands. If we do not learn to yield to the Holy Spirit, then we will be no different to the unbelievers, and we will not be able to take our place and bring order to this chaotic world. It is time to submit to the Holy Spirit! The sky is falling, and the sun is about to crash into the Earth! I know this sounds too dramatic. However, when you consider the fact that gun and knife violence has claimed the lives of 91 people this year, in London alone; the economic unrest all over the world, the neglection of the needy and deprived, the constant threat to our security due to terrorism and mass murders and the rise of sexual pervasion and gender confusion. The sky might as well fall, and the sun crash into the Earth. The world is in a chaotic state, and it bears a resemblance to how it was in Genesis chapter 1:2: “void, desolate and without form. Darkness covers the face of the deep”. We are truly living in dark times. You may even call it: Hell, on Earth! It is no wonder that the atheist does not believe in God, the agnostic is indifferent about the idea of a god, or the deist believes that God has abandoned the Earth. I mean, if there is a God, He should at least bring order to this chaotic cosmos. 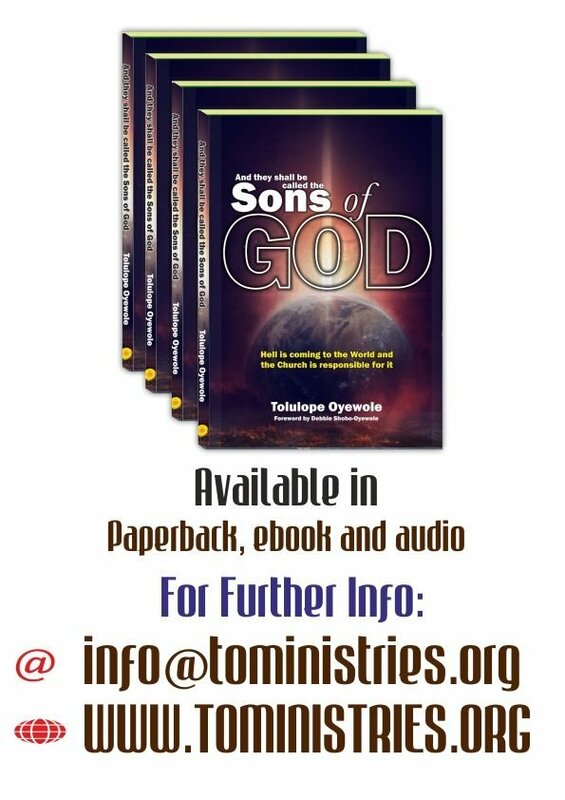 From these scriptures, we see that God willed the Earth to us humans and has empowered us – the Church in particular (I expanded more on this in my book: And they shall be called the Sons of God) to be His voice and bring the needed solutions to the Earth. Hence why I say that the Church is responsible for the chaos and atrocities – Hell, on the Earth. To the Christian community, before you cast your stones at me, ask yourselves these questions: Am I helping the weak and fatherless around me? Do I act justly and maintain the right of the afflicted? Do I rescue those who are without help? Am I intentionally pursuing God’s plan and purpose for my life or am I just chasing my next pay cheque? If we are honest with ourselves, we will see that we the Church have become complacent in the mission that God has given us. We are more concerned about the world receiving us rather than catering to the needs of the world. God has called us to be a fountain of solutions and a blessing to the world. If we switch off our light, to blend in with the darkness, have we not made the world even darker? This is why many people challenge the Church on the appropriation of funds donated by members. Beyond pastors flying private jets and leading a celebrity lifestyle, the world feels we do not care, and in truth, we don’t. If we did, we will stand up and shine our lights as brightly as we can, so that the whole world will see that we are the lighthouse that will save them from crashing into the rocks and lead them safely to shore. If we do not do this, the chaos will continue, many more will lose their lives, and we will give an opportunity for the enemy to claim more souls for his kingdom. As this happens, the world will be at our footsteps and begin to question the need for our existence. Many Churches will be closed down as a result, and others rise to flames. The question to us as Christians is that will we continue to sit inactively in the sweet-by-and-by and watch the world go to Hell or will we stand up and be counted – just as God has called us to do? God has called the Church to be the gods of the Earth. In Psalm 82, the Bible tells us that God is standing in the congregation of the mighty and He is judging among the gods. Further on, it tells us that we are gods because we are children of the Most High. We are called gods because we are children of God. Just as a lion will give birth to lions and a tiger will give birth to its kind; in the same vein, when we became born again, we are born with the same DNA as God. Therefore, we are gods. But the question here is, why then are we not operating as gods? Why are we not bringing the solutions and impact God has blessed us with to the world? The answer is we are ignorant of our identity in Christ, and therefore, we have been robbed of it. I heard a story about a wealthy man who died and willed his entire estate to his son. However, because his son refused to receive the education his father provided for him while he was still alive, he was unable to read the will to know what his father had provided for him. So, he suffered severely as a result. He had to resolve to menial labour to meet ends meet; even though he was a wealthy man. It was until when the man had an encounter with someone his father had helped in the past – who was surprised at his condition, read the will to him and exposed him to what was already his. The same is with us as Christians. Except we open our hearts and be willing to study God’s word to know who we are and what God has made available to us, we cannot do what He has called and empowered us to do. Instead of us solving the problems of the world, we will be the ones in need of help, because we do not know who we are. Ignorance is a choice. I say this because, even if you are genuinely ignorant, you can make an effort to find out. So, it is time to find out, stand up and take your place as a god on the Earth. If we do not, we will suffer the same peril as those God has empowered us to deliver.